About a week ago, I started working on a post about former Olympus CEO Michael Woodford, who was fired after raising concerns about the company’s excessive payments related to acquisitions. It is rare that a CEO goes public about such things, rarer still that a company fires the CEO without investigating the matter completely. Yesterday we learned why these payments were made: to hide unrecognized losses that go back decades. The company admitted this yesterday. Mr. Woodford has continued his quest for the truth since his firing, including this YouTube interview with Reuters today. The old-line members of the Olympus board thought that by firing Mr. Woodford, he would go away quietly. Apparently they are not versed in the ways of modern news gathering and social media. Likely, they will all be gone soon. The point I was going to make is when a company would fire a CEO for bringing allegations forward, how can a company expect the rank-and-file employee to take compliance seriously? Unfortunately, another chance for the CEO as whistleblower has emerged in the last few days. It involves Penn State University and its legendary head football coach, Joe Paterno. I think anyone knows the basic facts at this point: over 10 years ago Mr. Paterno was made aware of allegations of sexual abuse against a former long-time assistant coach at Penn State, Jerry Sandusky. Mr. Paterno informed his supervisor, the Penn State athletic director. Mr. Paterno seemingly did not go to the authorities, and Mr. Sandusky had continued access to Penn State athletic facilities. There remained connections with Penn State and a group aligned with Mr. Sandusky that was supposed to support at-risk young boys. Make no mistake about it, Mr. Paterno was the CEO at Penn State. Over the years, he was encouraged to run for public office; these sordid allegations emerged a week after he set an NCAA record for wins at a major football program. Mr. Paterno will resign soon, and his departure will likely be called “retirement.” The athletic director is on leave, and the university president is hanging by a thread. Olympus had a great president, and fired him for doing the right thing. 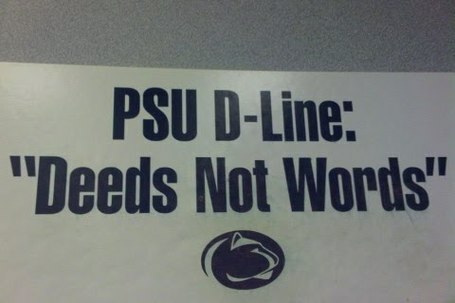 Penn State had a great football program, and the university now is associated with crimes against children. And its CEO seemingly did not do the right thing. If leaders don’t act in congruence with compliance, we can’t expect employees to take any of the platitudes about integrity seriously.